The aim was to functionally utilize a small apartment on the top floor of a building from the 30s min. century building in central Prague. From the sunny studios in vlastnctví architect thus leaving only the outer walls and preserved original parquet floor. The original bathroom and all interior walls were demolished, including the skylight. The layout dysfunctional entry into the apartment was resolved sliding door opening and changing the original opening of the front door. The idea was to be opened up and make it a spacious and airy unit. After they succeeded mainly due to the construction of a glass-enclosed bathrooms throughout its length. The newly formed bathroom creates a kind of a separate box in the apartment. In order to her through glass partitions were not seen, it has a retractable waterproof black curtain. 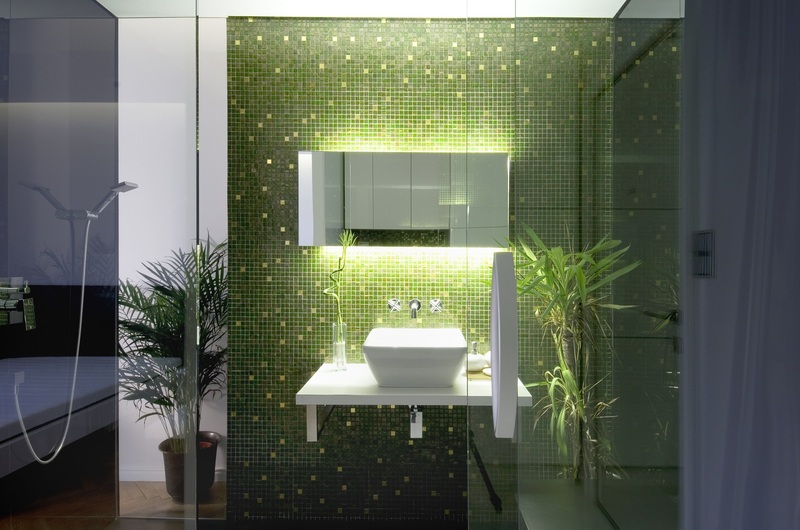 The bathroom is all tuned to black, only the front wall is lined with green Bisazza glass mosaic with golden elements (used Bisazza mosaic MISCELE Oro 20). Black is in addition to facing the Lacobel and toilets as well as lacquered flooring from exotic wood Bankarai. Under this slatted floor are cleverly hidden drains for water diversion from the shower (which is housed in the construction of the ceiling). Conversely, a kitchenette, which is located at the site entrance hall opposite the bathroom is decorated in white. Pure white is also the floor of cast epoxy resin. The original living room has been preserved and have been restored parquet, which give the space a touch of typical dwellings from the period between World. wars.